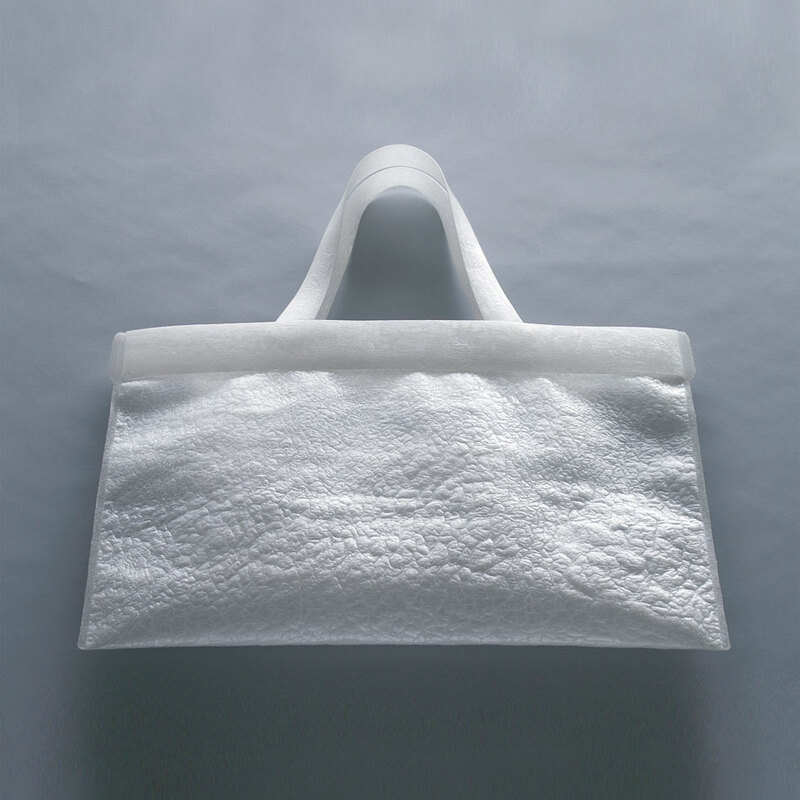 PE is a series of handmade products designed by Nobuhiro Sato that fully utilizing polyethylene materials, an approach to industrial materials with the techniques of craft and artisanship. The name of the brand—pronounced "pe"—is an abbreviation for polyethylene. Melting and welding a number of colored plastic bags together with a household iron and soldering iron, each product is made with care and attention to detail. 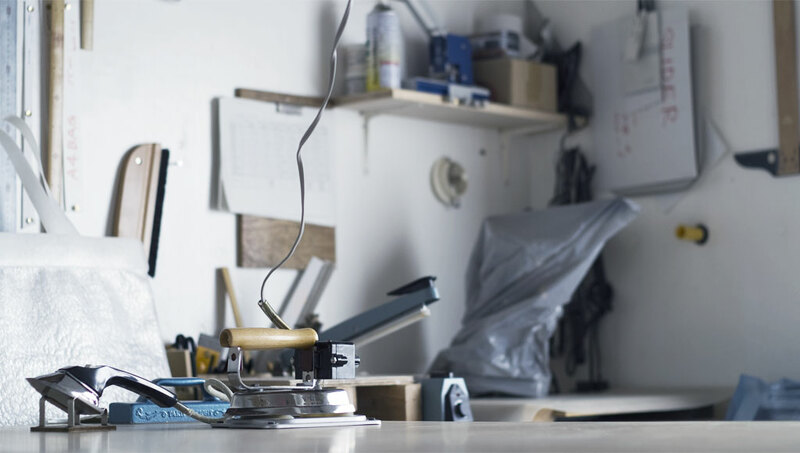 All the products are meticulously designed and produced by hand by Kyoto-based craft designer, Nobuhiro Sato. The production methodology is simple yet highly distinctive. Using different sized household irons, over time polyethylene films are welded and laminated into many layers. This results in changes to the texture depending on the number of polyethylene layers, the iron temperature and pressure, as well as the ironing motion, reflecting the detailed and delicate sensibility of the designer's hands. Natural shrinkage, wrinkles, unevenness, and unique texture are all characteristics of the product. The worldview of the product is also enhanced by the glossy plastic surface and vivid color choices. PE's simple design highlights the material itself and prunes away unnecessary decoration. The designer started experimenting with the processing method and materials from 2007, releasing prototypes which were followed by the launch of the brand in 2010. Mass-production and optimization of the production process have made it possible to deliver quality goods to a large number of consumers quickly. However, we decided to make only products crafted by hand in limited quantities and to deliver them to our customers at a more gradual rate. While we are aware that our production methodology goes against the current economic model and makes our customers wait, we believe there is a definite value created only through the sensibility of crafting each and every item by hand. We continue to explore different ways of delivering our products to those who appreciate and understand our PE products. We hope you will enjoy the richness of these polyethylene products, created in a handcrafted style different to mass, machine-made products. 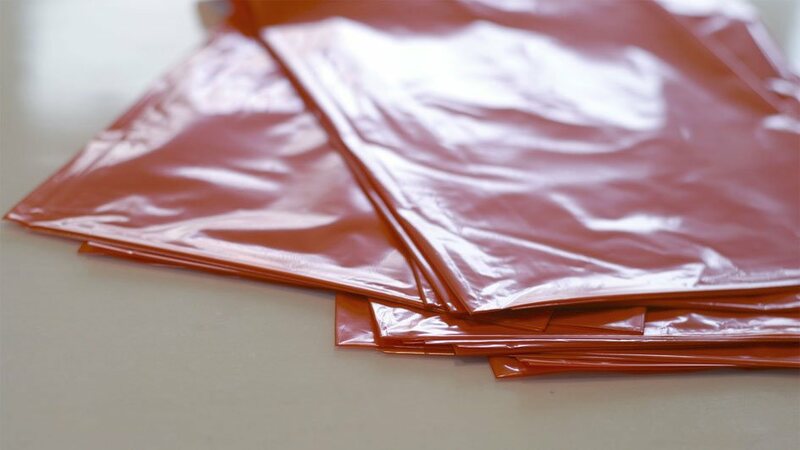 PE uses a color polyethylene film (Low Density Polyethylene) with a thickness of 0.024-0.04mm, normally sold at general market retailers as a "plastic bag." Using a household iron as a processing tool makes the entire process of creating the product more accessible, from the acquisition of material to production. The aim is to build a genre of craft that does not require professional facilities. 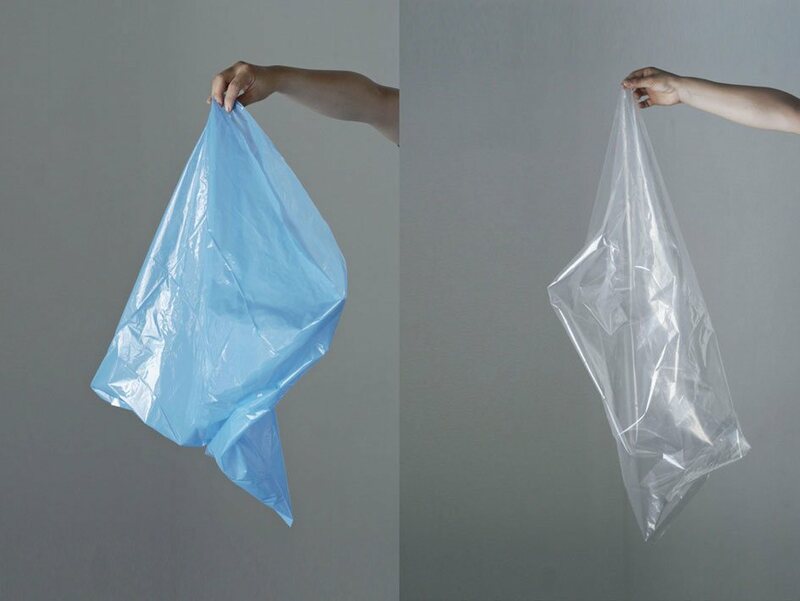 In particular, use of the 45L plastic bags that are distributed widely in Japan as our standard material enhances this objective. 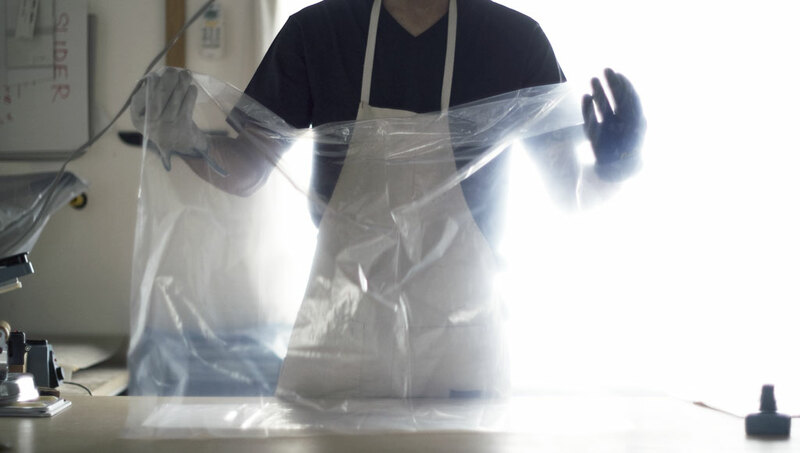 In the same way that it is used for garbage bags, with its unique water and chemical resistance characteristics polyethylene does not generate toxic gas. 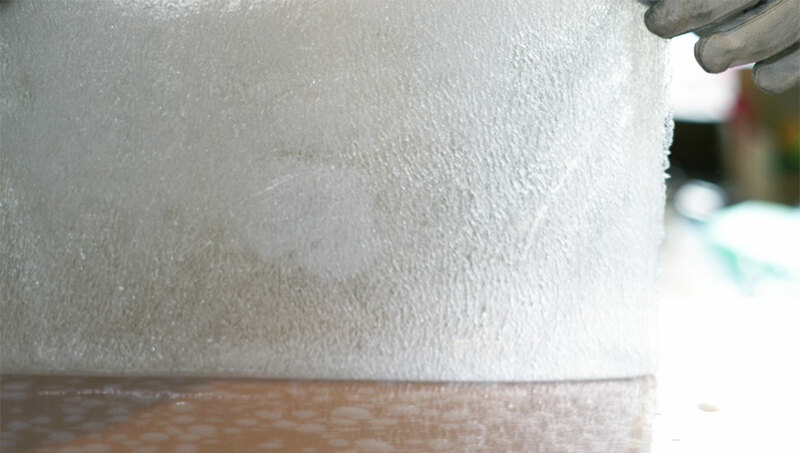 Low-density polyethylene softens when it is heated at 70 to 90 degrees Celsius, meaning that when it is partially heated it can be melted and laminated into layers. Taking advantage of this, PE uses different types of soldering irons to process the whole sequence from creating fabric to molding parts, joining, and finishing the details. Layering the polyethylene films, they are heated and pressured slowly with a soldering iron. 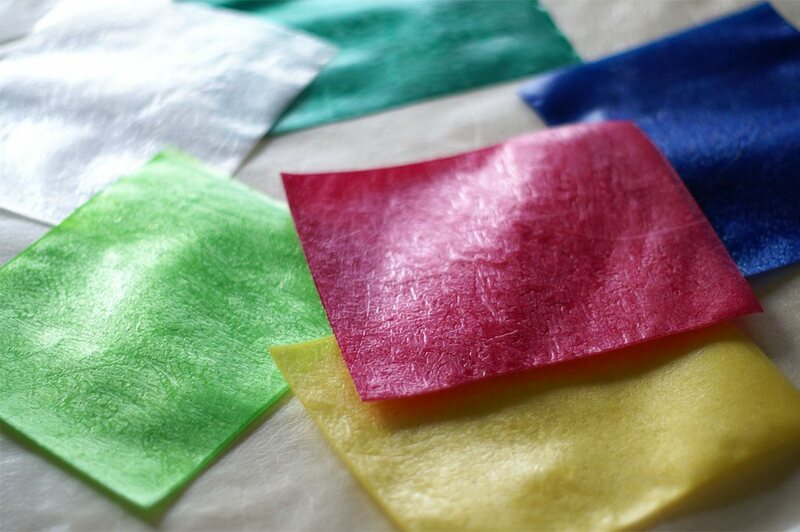 By repeating this process over again, the width and strength are increased and a fabric is created with natural shrinkage, wrinkles, uneven surfaces, and tactile texture. The number of layered films is changed and adjusted, along with heating temperatures, hand movement and pressure to create variation in width, stiffness, and texture for different products and parts. Since the parts connecting handle and body require strength as well as flexibility, 48 to 60 layers of film are laminated. While a thick stick-like form is made for the handle, the surface of the bag’s body is uneven and with a layer of air locked in for cushioning. As the entire product is made with laminated layers of film, the finish has a very light texture. A soldering iron is used to weld things by hand, from the assembling process to joining. Not using the specialist, mass-manufacturing machinery normally used for processing polyethylene results in a design that is precise and detailed, but without traces of the processing. The color of the film used in the materials determines the color of the product and, since there is no post-molding coloring, color loss is not an issue. Both gold and black supply a sense of luxury, while vivid colors such as yellow and pink bring out the chemical and pop texture unique to plastic. With its feeling of buoyancy and translucent wrinkles, the transparent texture made with clear film best expresses the PE concept. Sato Nobuhiro is a craft designer born in 1977. He graduated from Kyoto Seika University's Architecture program. After working at a manufacturer of carved ornaments and decorative designs, he established "PULL + PUSH PRODUCTS（Current Pull Push Products.）" in 2002. He generates products through handiwork, with special attention to the material used and the stories they tell. Based in Kyoto, Pull Push Products. is a crafts brand, engaging with every process of product development directly, from planning original products to manufacturing, packaging, and shipping. Created out of concepts of material and story, our items place an importance on the sense of fun and the joy of texture experienced when using them. Expressing the delicacy and compassion that eludes the machine-made, PULL PUSH presents products that convey the warmth of the designer. Copyright © - Pull Push Products. All rights reserved.